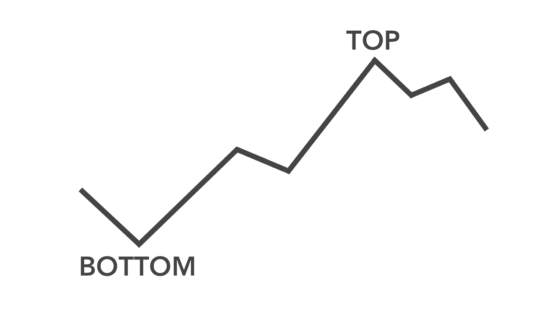 I think you’ll agree when I say that one of the most difficult tasks when reading a chart is to understand the real sentiment of the Market participants. What if you can do it with a really simple and intuitive indicator? 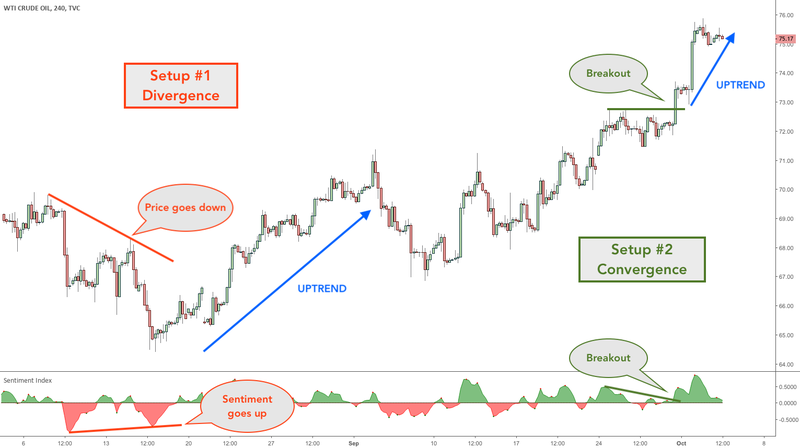 In this article, you’ll learn two popular Trading Setups with the Sentiment Index, one of the best Trading Indicators for TradingView. The Sentiment Index was developed to reveal the actual Sentiment of the market in real-time. Even a beginner trader can now understand the real Sentiment, be it positive or negative, and adjust his trades accordingly. These two Trading Setups with the Sentiment Index work on any chart! 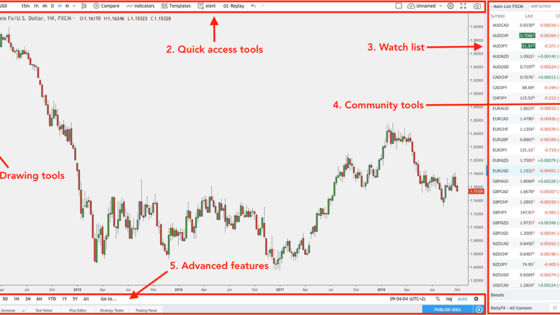 In fact, all our popular Trading Indicators for TradingView where developed to work on any asset and on any timeframe. So, let’s get to the setups! The first setup is highlighted in red in the chart above. This setup is very intuitive and always straightforward to identify. The price is initially in a quite significant downtrend, from around $71 to about $64. However, the negative Sentiment Index is trending up rather than down. This means that the price and the Sentiment Index are diverging and the down movement should not be trusted. In fact, a similar condition is always a great indication that the current price movement is losing strength and a market reversal is due soon. As you can see from the chart above, as soon as the Sentiment turns positive (green) a new significant uptrend takes place. So, the rules for this setup are very simple. Let’s now see the second setup. The second among the two Trading Setups with the Sentiment Index is similar but even better. Because you can easily identify the exact moment in which you should enter a new trade. This second setup is highlighted in green in the chart above. Initially, we have a very strong uptrend and the positive Sentiment Index (green) is indeed weakening – not a good sign. However, the uptrend stops and the price starts consolidating with an almost parallel movement. Don’t be tricked by the movement: it could also be any other consolidation, hence even against the trend. In this circumstance, we are able to draw a trendline, both on the price and the Sentiment Index (see the two green trendlines). What happens next is that both the price and the Sentiment Index break up at the same time. The price moves up and the positive Sentiment Index moves up as well. This is a great indication that the bullish movement is very likely to be sustained. So, once the breakout is confirmed (always wait for the close of a candle!) you can enter your trade. Let’s now review the rules of this second setup. 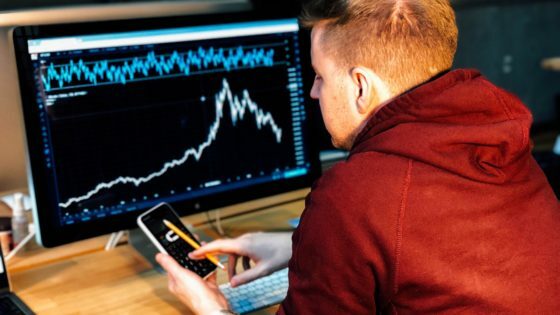 The two Trading Setups with the Sentiment Index explained in this article have been tested and exploited, across the years, by a countless number of fellow traders. They keep appearing every single day across multiple asset and timeframes, even on yours!